Dahlhaus Lighting produces one-of-a-kind, made to order, custom lighting and accessories. 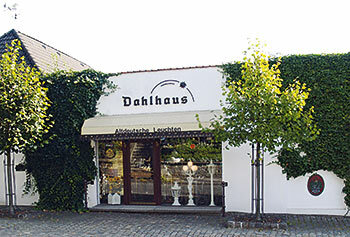 When you think about vintage European lighting, look no further than Dahlhaus as your manufacturer for “Instant Antiques”. Our products are crafted as they were 100 years ago, yet with the technological advances of tomorrow that offer you impressive lighting solutions reflecting our dedication to: Original Vintage Design, Highest Quality Materials, Authentic Craftsmanship and Outstanding Service. For more than fourty years, we have specialized in reviving vintage lighting for residential, commercial and civic sites. Our line began with a simple carriage light we found in England, built according to a period design. We continued to discover other period designs and castings all across Europe. Today our collection includes many of the street lamps and lanterns, as well as bollards, fountains, ornaments and mailboxes, that once graced Europe’s cities, towns and estates. We take pride in all of our products, knowing that they preserve the elegance and quality craftsmanship of a bygone era. Detailed specifications for each of our products are available upon request. Let us take you on a virtual tour through our unique Showroom. The new full color catalog offers an easy way to give you a complete overview to our unique selection of handcrafted lanterns, mailboxes, wall signs and many more articles.